God Created YOU to be A Woman of Worship! 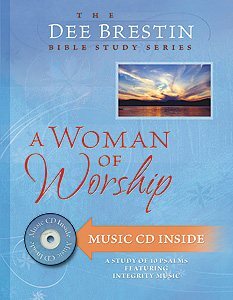 In this dynamic study on the Psalms, Dee Brestin, renowned Bible teacher and bestselling author, guides you through 10, in-depth lessons that will teach you to worship out of your heart's need just as the psalmist David did. Thought-provoking questions will inspire you to be open and honest before God. You'll be challenged to share your deepest personal sorrows, concerns and fears with your Heavenly Father. The music CD, featuring Integrity songs such as Shout to the Lord and I Was Made to Praise You, will help you easily memorize the Psalms you'll be studying. Let A woman of worship take you to new levels of intimacy with God.